McNish began competing in motorcycle events but because of his small size he found that he was at a disadvantage and so switched to karting when he was 11 years of age. He was soon winning Scottish and later British titles. In 1987 he switch to cars in Formula Ford 1600 with the Ecurie Ecosse team and impressed and at the end of the year was one of thr drivers chosen by Marlboro for the annual driver selection event. McNish and Mika Hakkinen were picked to be Marlboro drivers in Formula Vauxhall Lotus, teaming up in the new Dragon Motorsport team. It was a great success with Hakkinen winning the Opel Euroseries and McNish winning the GM Lotus series in Britain. The pair then moved to the British Formula 3 championship with McNish joining West Surrey Racing and Hakkinen going with Dragon. McNish made the better choice and was soon winning races and battled for the championship with David Brabham. At the end of the year the Marlboro-sponsored Pacific Formula 3000 team ran McNish in the final round of the series, replacing JJ Lehto who had moved to F1. In January 1900 McNish signed a three-year deal with McLaren as a test driver. He joined Erik Comas in the Marlboro-funded DAMS Formula 3000 team. In the first race of the year McNish tangled with Emanuele Naspetti and had a huge accident, a spectator being killed by the engine which was torn off his car. He recovered from that blow and came back to win two races and finished fourth in the series. He stayed with DAMS in 1991 but had a disappointing year and while his rivals moved into F1 McNish remained a test driver until the end of 1992. He then joined Benetton to fulfil a similar role and helped to develop systems which were used on the World Championship-winning Benetton B194. He continued to work with Benetton until 1996 but then became involved in the disastrous Lola F1 programme. After that he decided to concentrate on sportscar racing and in 1998 he shared a Porsche will Stephane Ortelli and Laurent Aiello to win the Le Mans 24 Hours. In 1999 he joined Toyota to race the GT-One sportscar and as a result was picked to be Toyota's F1 development driver in 2000 and 2001. 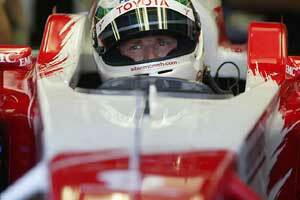 He continued to race in sportscars with Audi but in 2002 made his F1 debut with Toyota. He had a solid season but was dropped at the end of year. Although disappointed McNish was fortunate to have escaped unhurt from a huge barrier-splitting crash at Suzuka at the end of the season. For 2003 he was signed to be a test driver for Renault Sport but then drifted back to sports cars with Audi and in 2005 moved to the DTM.